On these banners are written the names of the people killed in the shooting at Pulse nightclub in Orlando on June 12, 2016. Each a beloved child of God. Please feel free to use this space as a public memorial to mourn, pray and lament. We join our prayers to the millions who are praying for the families of those who died or are injured. May God give them comfort, strength and peace. We are also acting. 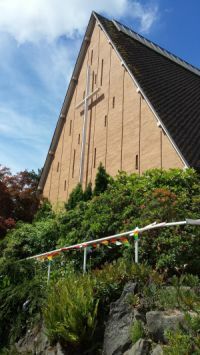 For the fifth year in a row we will be marching in the Seattle Pride Parade with numerous other Christians, showing our love and support for the LGTBQ+ community (Lesbian, Gay, Transgendered, Bi-Sexual, Queer, Plus.) God loves all people unconditionally. We cannot express that strongly enough: GOD LOVES ALL PEOPLE JUST AS THEY ARE. 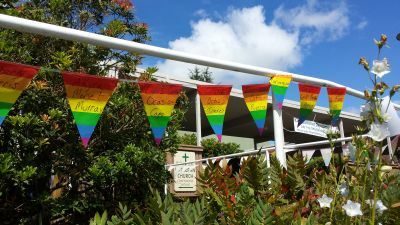 We confess that historically the Church has discriminated against the LGTBQ+ community and for that we repent. 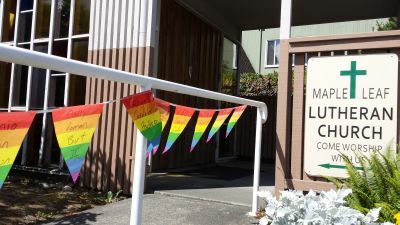 We are actively working to support and welcome LGTBQ+ people here at Maple Leaf Lutheran Church. All are welcomed to fully participate in this faith community. May God help us in this effort. 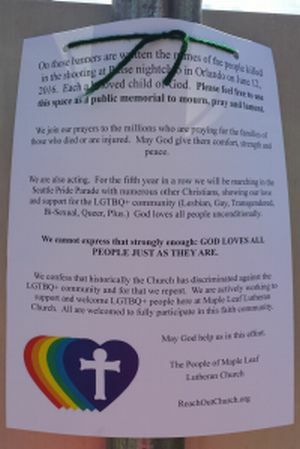 The People of Maple Leaf Lutheran Church.